Giving birth can be such an amazing experience and something that moms wait up to nine or even close to ten whole months to experience. However, it’s often thought that moms-to-be can only give birth in a hospital. While this may be one of the more standard birthplaces, it is so important to know that you have options! In fact, you have quite a few options, and it will all depend on what you envision for your birth, your health, and what type of care provider you see throughout your pregnancy. In this post, we are going to talk about the four different birthplace options for you to consider. Maybe this will get you thinking about what type of birth you would like to have and ease up some anxiety surrounding birth. If you know you have options, it can take some of those fears and anxiety away. The most common place to give birth is in a hospital. Hospitals offer a number of benefits like the ability to get an epidural if wanted, a medical team in case of an emergency, in some cases a NICU, and of course an operating room in the event of a C-section. Hospitals feel safer to a lot of women since there are many interventions available if need be. A hospital is likely the place a momma will give birth if she has to be induced for any reason. However, while a hospital may feel safe to some moms-to-be, others may experience anxiety when in a hospital setting. Fear and anxiety is not something you want on the day you bring your bundle of joy into this world. Not only is that not a feeling you want to experience on one of the happiest days of your life, but it can also stall labor. If you are looking for an intervention-free birth, and your care team has agreed that you and baby are healthy enough to have your baby outside of the hospital setting, this could be a good option for moms who want a more natural birth or for those who simply do not like hospitals. Birth centers are another popular option for pregnant mommas and are becoming more mainstream as more moms are looking for fewer interventions when it comes to birth. A birth center offers a more natural experience than a hospital in most cases, and they may even offer birthing tubs for water births. Giving birth in a birth center also almost always means you get to go home with your baby much sooner than if you had given birth in a hospital. Most moms go home the same day! Birth centers are a great option if you are looking for a controlled environment to give birth with midwives present, but don’t want all of the interventions that a hospital setting can bring. Many birth centers have birthing rooms that may look similar to a room in your own house, so many mommas feel much more relaxed and comfortable in this type of setting. Birth centers do not offer epidurals or the ability to perform C-sections, so this is something to keep in mind when making your decision. When it comes to choosing a birth center, you will want to find out where the nearest hospital is and what their hospital transfer rate is. You can also ask if the midwives will be present for your little one’s birth if you had to be transferred to a hospital for any particular reason. You may also want to ask if they offer any type of pain relief options such as nitrous oxide if this is something you would ultimately want available to you during labor. 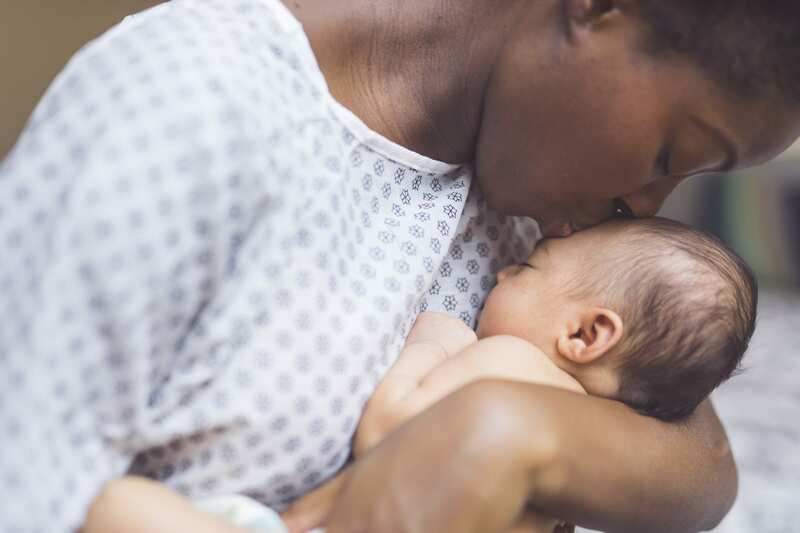 Birth centers are an excellent middle of the road option for moms who want a natural birth, but still want a care team present and able to have the option to transfer to a hospital if absolutely necessary. Another option that is becoming more popular are birthing centers within a hospital. Some hospital maternity suites are now offering a separate section for those who are looking for more of a natural birthing center experience. These areas of the maternity suite may have birthing tubs and midwives as opposed to OBGYN’s. This is an excellent option for the mom-to-be who is aiming to have an unmedicated birth, but would rather give birth in a hospital setting. And then there’s the home birth option. Many moms choose a home birth to completely eliminate the possibility of medical interventions during birth. While this option is not for everyone, moms who have had one home birth often swear they would never have it any other way. Some moms give birth in their home with just their support system present, but the more popular option is to work with a midwife who assists with home births. One of the many benefits of this is that your midwife will often come to you for prenatal and postnatal visits, so you can have your prenatal care in the comfort of your own home. Another big benefit is that you have access to your own home, your own food, and your own bed during labor and after your baby is born. While not for everyone, a home birth is becoming a fairly popular option among women who want an intervention free birth. When it comes to giving birth, know that you have more than one option. Don’t let the fear of thinking you can only give birth in a hospital cause you anxiety! Knowing and understanding your options will only make for a more empowering birth, and if you are pregnant, there’s no better time than now than to start planning what you want your birth to look like.